Small space dwellers should absolutely consider color and color accents in their small spaces. An accent wall or wallpaper in colorful palettes can open up a small space. That being said, if color isn't really your thing, then consider staying with a theme throughout your entire small space - every room. I spotted this fabulously designed home by Jessica Helgerson. 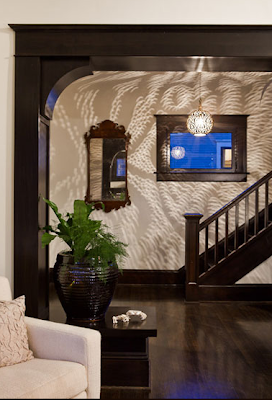 It's theme - stark white walls with rich dark wood accents. The living room, dining room, bedroom, etc all have this look integrated into the space and it works! Check out the full slideshow here. 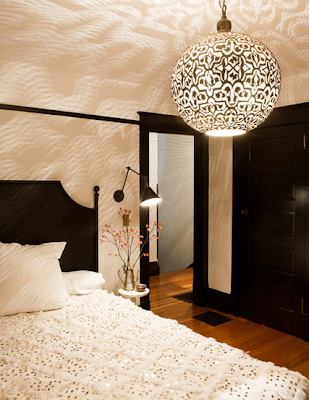 2 Responses to "THEMES MAKE A BIG IMPACT"
I love how that light shade adds such texture to the bedroom, it's like repeating the texture on the bedding on the ceiling. Very cool. jeez I love that house!